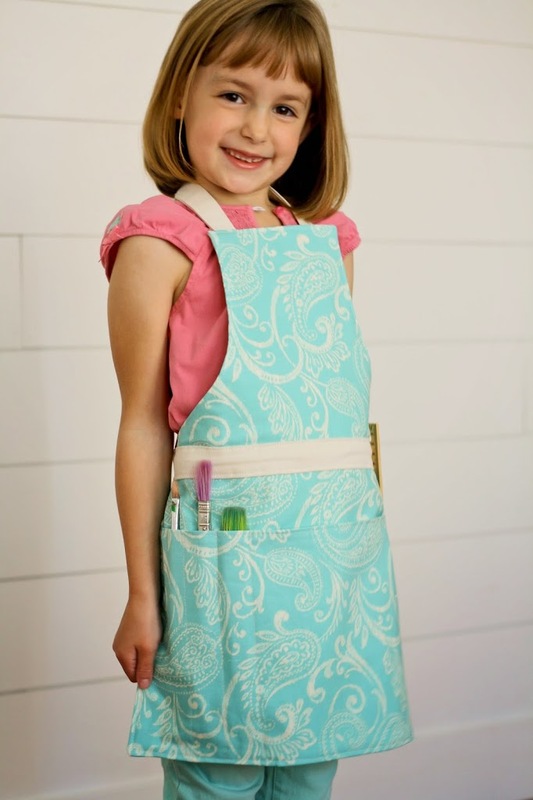 You are here: Home / Sewing / Child’s Apron Pattern – available for PDF download! 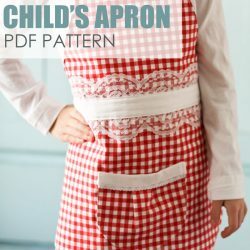 Child’s Apron Pattern – available for PDF download! 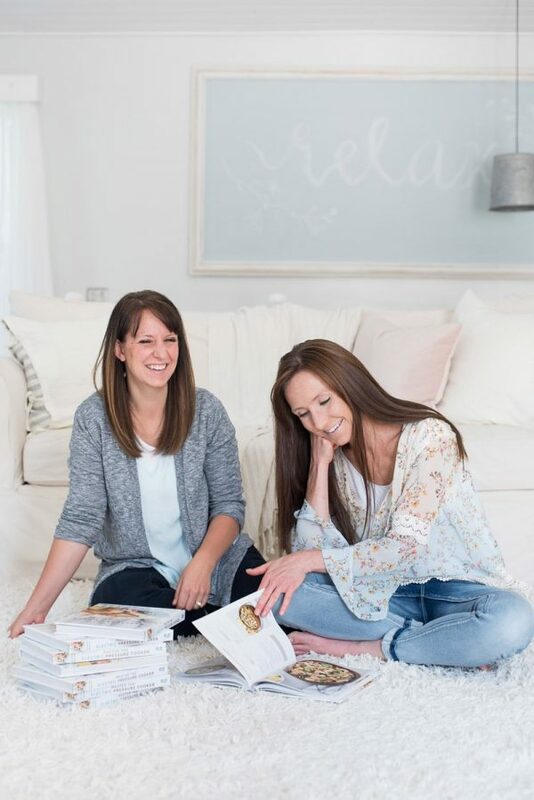 I am so, so EXCITED to finally be sharing this with you! It’s a little something I have been hoping to make available to you for quite some time. It’s a little something that has burnt all my midnight oil. It is a little something that I truly hope you can enjoy. 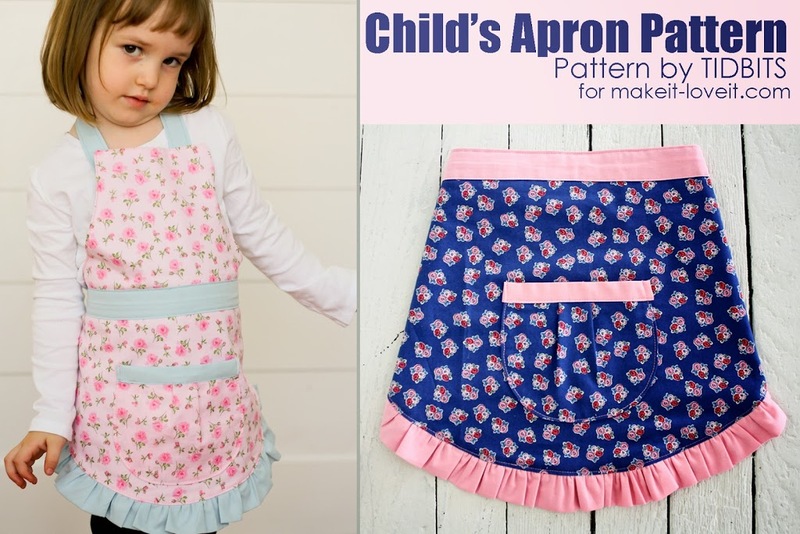 I have partnered up with Ashley, from Make it and Love it, to bring you this Child’s Apron Pattern. Found in the Make it and Love it pattern shop (also available is a “Rights to Sell” limited use contract). 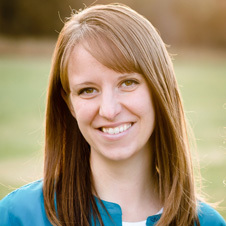 I have so enjoyed working with Ashley! 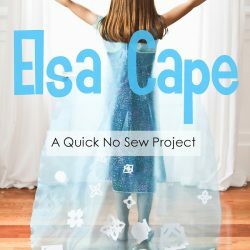 She is kind enough to let me post my projects over on her website from time to time, as a contributing blogger, and it has been a great experience to do that. I’ve learned a lot, it pushes my creativity, and let’s be honest . . . a lot more people see my stuff over there then over here ;). I actually had the chance to tag around with my husband on a business trip over in sunny Colorado, where she lives. I practically knocked down her door I was so excited to meet the amazing maker of Make it and Love it (and bonus – her two littlest ones who don’t go to school yet)! 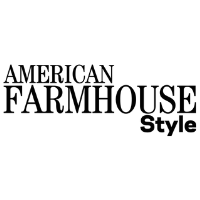 Any way, we got to talking, and I mentioned a pattern that I always wanted to make available on this world wide web. She gave me the go-ahead and I totally jumped on it! Now after about 3 weeks of blood, sweat, and tears (or more like cereal for dinner, digging through dirty laundry to dress my children, and one filthy house), it is done! 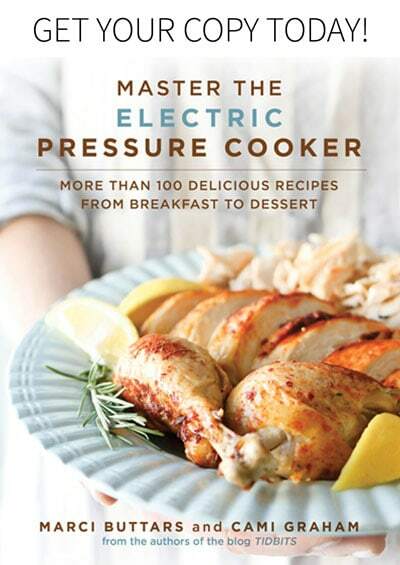 I’m exhausted – but totally satisfied – and I hope it will come in handy for many of you! Let me tell you about this pattern! 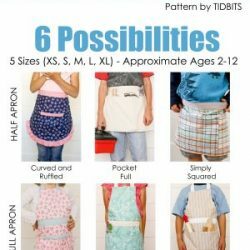 It is 1 pattern, 5 sizes, and 6 possibilities – giving you the most bang for your buck! 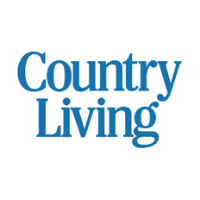 It is designed for sewing levels from beginning to advanced. 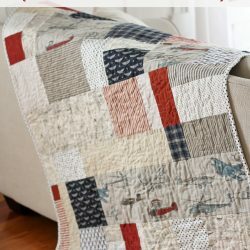 If you are just starting out in your sewing journey, this pattern will guide you through every single step of the way. 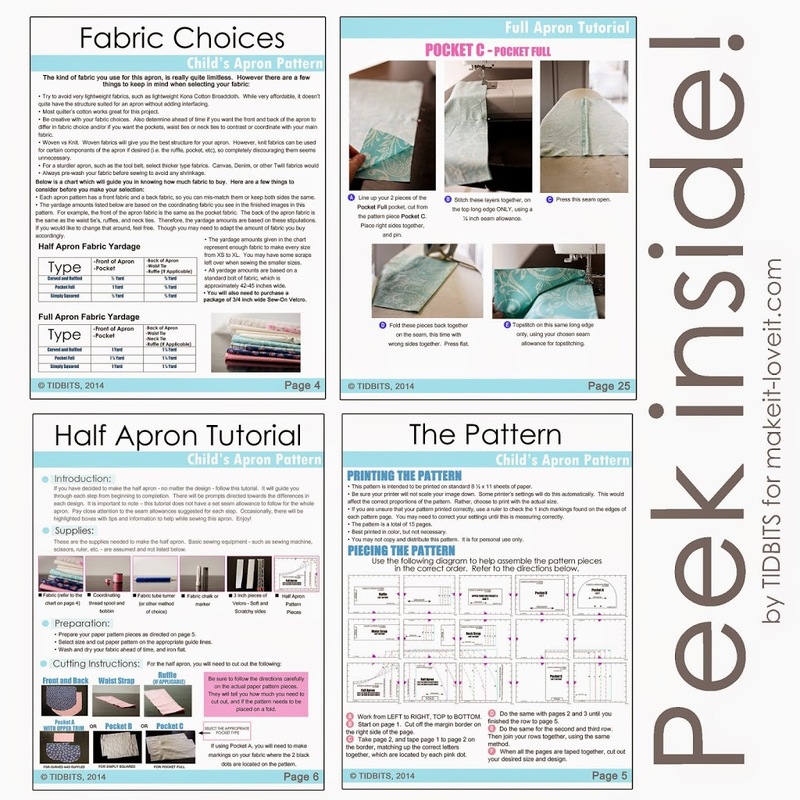 It not only comes with clear pictures and detailed directions, but I offer you sewing tips and suggestions along the way to help you make this apron look as professional as something you would find in a store – probably even better! 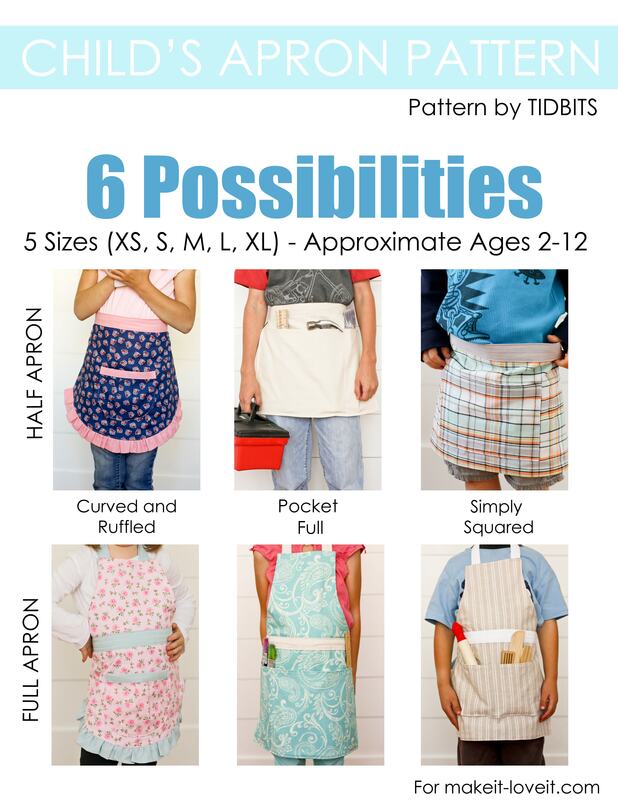 If you have been sewing for quite some time, this pattern will do all the thinking for you. 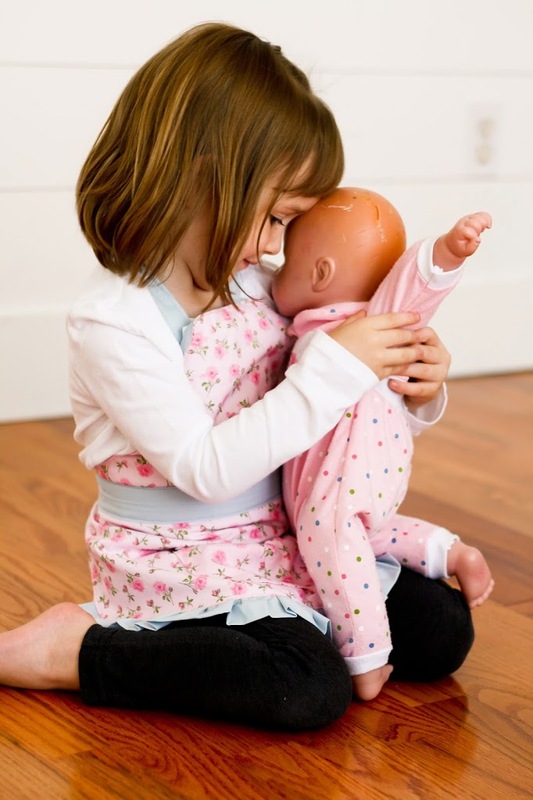 No need to fuss over methods of sewing or measurements . . . it is all there for you and you can sew one up in no time! 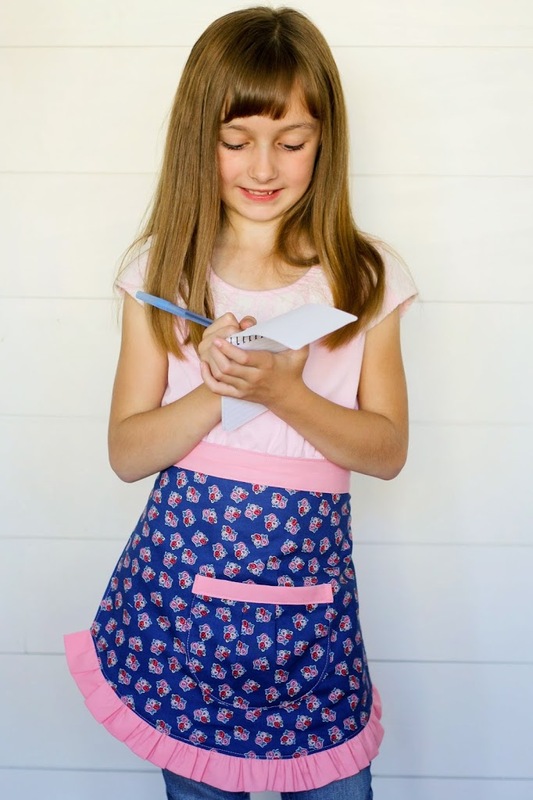 Everything you need to know about sewing this apron is layed out in a clear, easy to follow format. 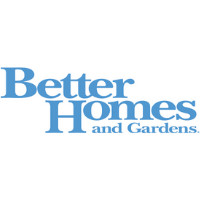 You’ll find information on design possibilities, sizing, fabric choices, how to piece your pattern together, supplies you’ll need, and more. 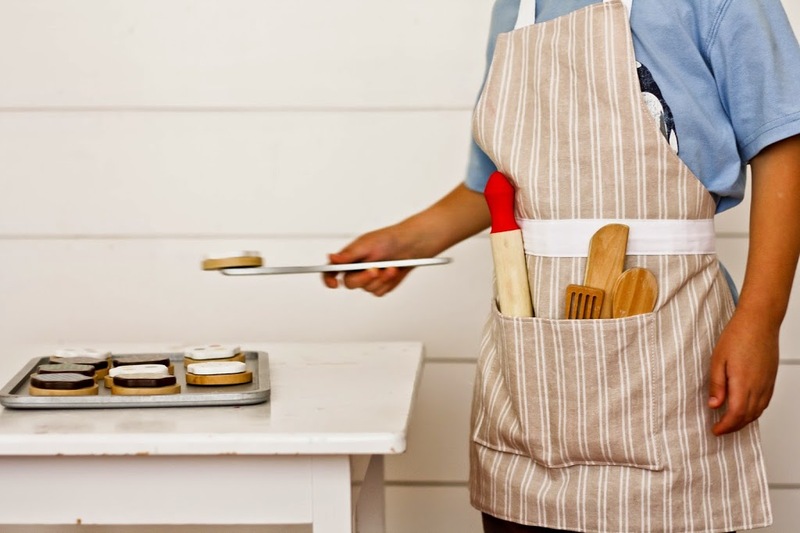 Now let me tell you more about the apron. 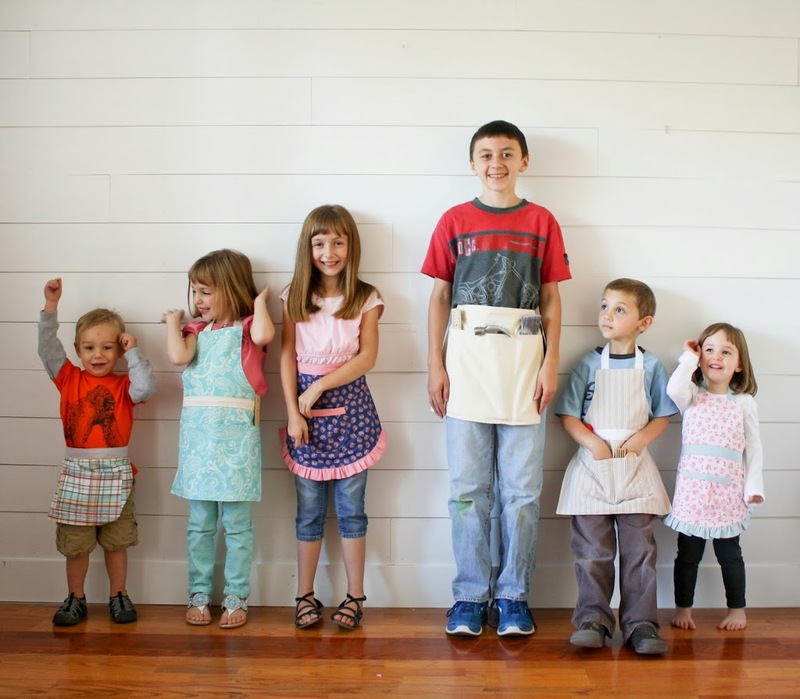 Perhaps the best feature of the apron, is that it is very child friendly. 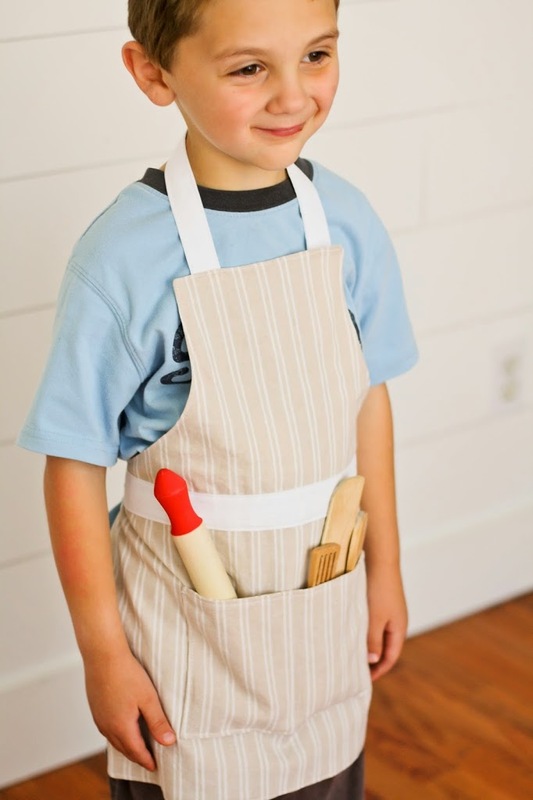 Your child will need little or no help putting their apron on and taking it off. 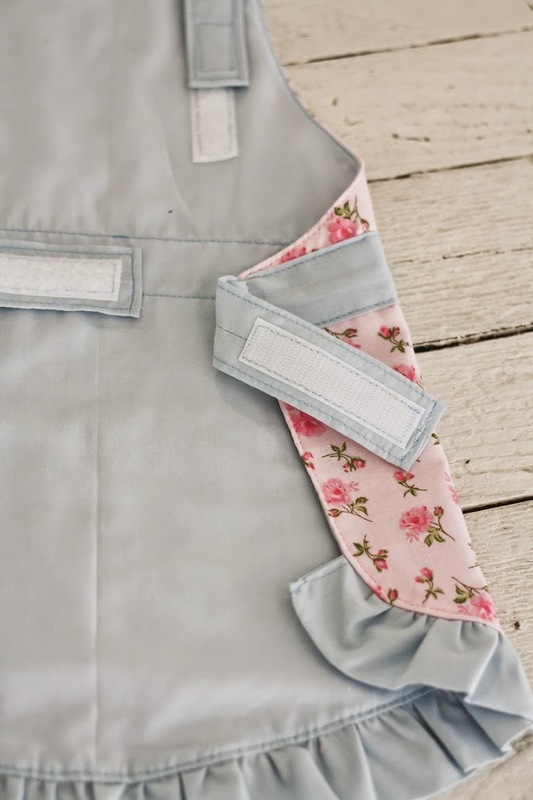 The Velcro closure for the waist band is not only simple to sew on, but provides easy adaptability for your child. They have the capability to be taken in 3 inches at the waist, or taken out 3 inches. 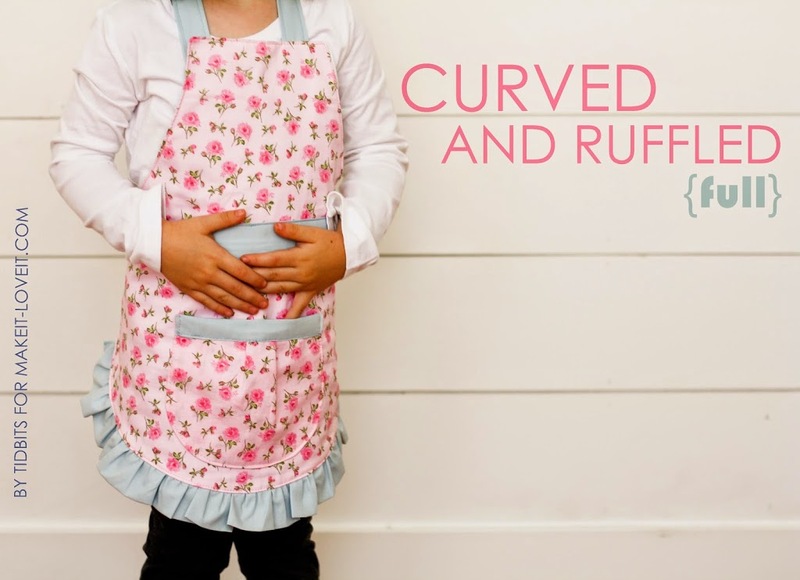 This apron can adapt to your growing child for possibly a couple of years. 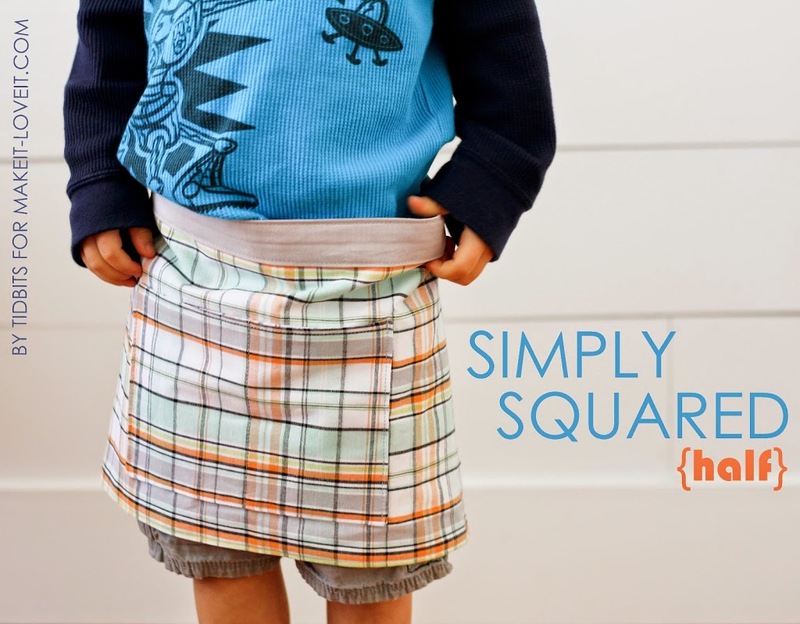 Pattern sizes range from approximately 2 years old to 12 years old. 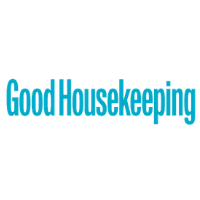 For the full aprons, the Velcro attachment on the neck also allows for the length to be extended or shortened as need be. 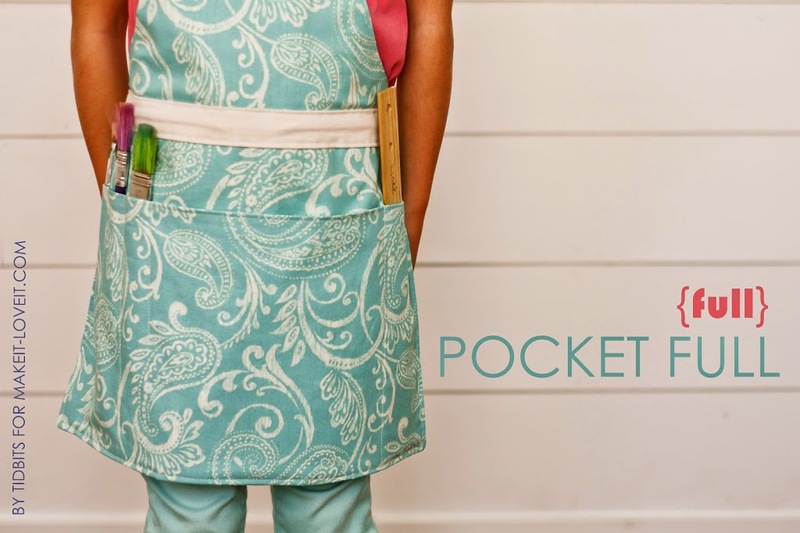 Each method has it’s own style of pocket, allowing these aprons to function in many ways. Now let me discuss each design with you. 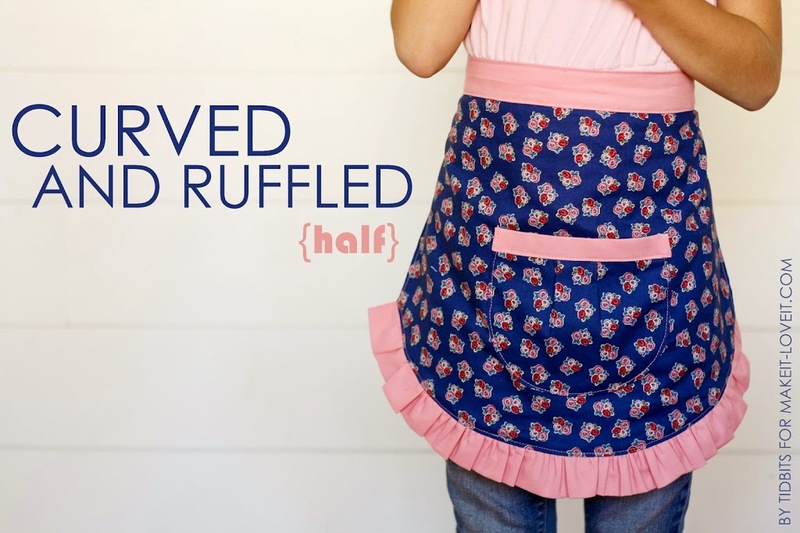 The full apron makes for such a darling little mommies helper! My little one insists on wearing it most the day! Or give it a full cover, to protect clothing while still keeping the essentials close at hand. 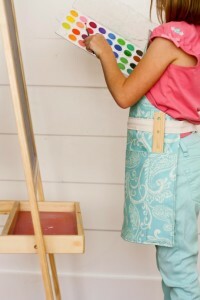 My little artist is thrilled with her new apron! 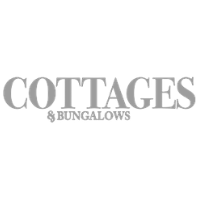 Sometimes, it is best to just keep things simple! 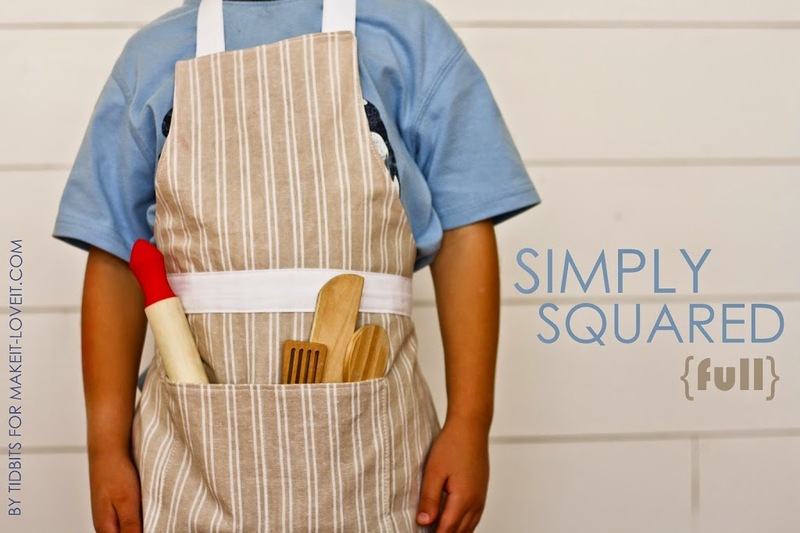 This SIMPLY SQUARED apron with a squared pocket does just that. 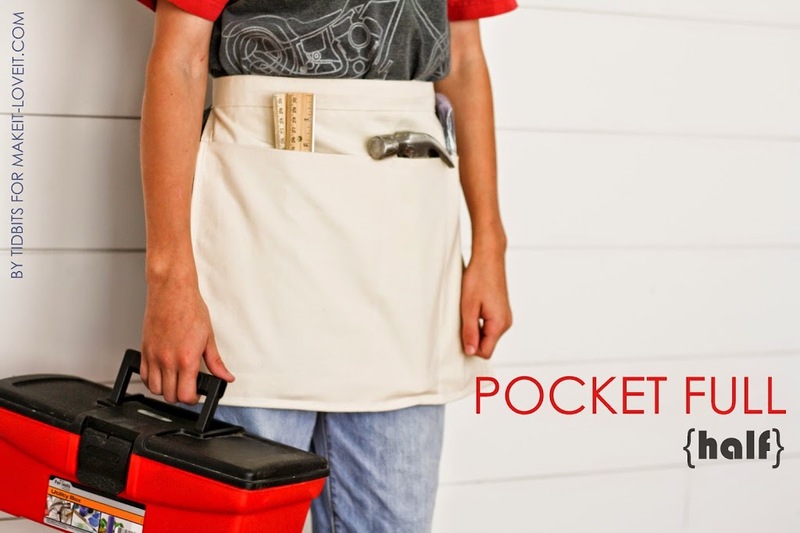 These simple pockets still allow your child with enough “stuff space” to help around the house or yard. And they are a perfect fit for little hands. Make sure you head over to Make it and Love it for all the purchasing details! Share on Instagram, by tagging your photo with #childsapronpatterntidbits and tagging one or both of us with @camitidbits or @makeitandloveit. Or feel free to send me an email at camitidbits at gmail dot com. Also – I can’t end this without sending the biggest virtual (and literal) hug to my sweet husband. 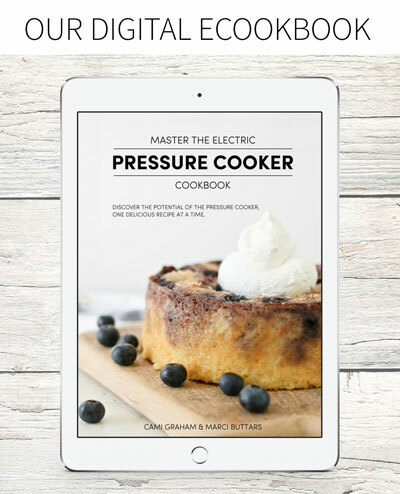 He not only made us dinner, and cleaned the house while I did this, but he is also to thank for turning my hand drawn pattern into digital format. Finally, his engineering degree put to good use! Ha! Love that man! 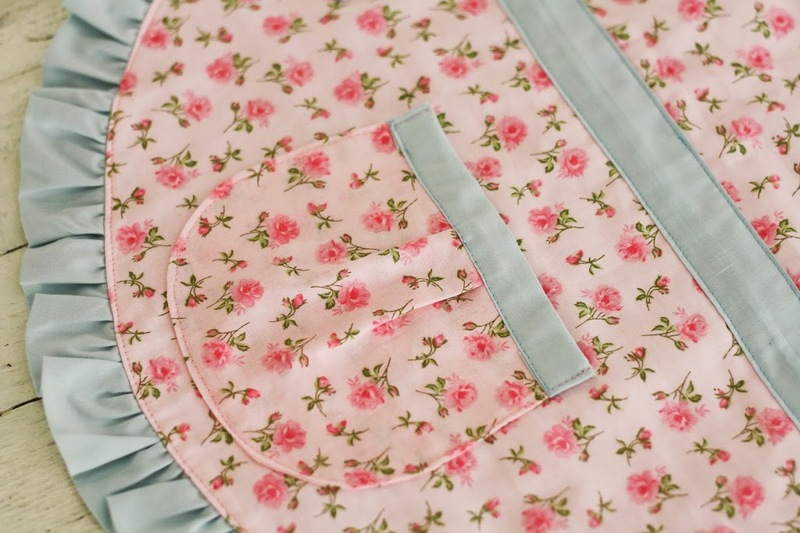 Where did you find the pink rose fabric? Adorable.